Kieran and I had the pleasure of being invited down to speak at the opening ceremony for this year’s ProcJam (Procedural Generation Jam) at Imperial College London. It was an awesome event and I thought I’d do a little blog detailing what I remember of the day so I have it here for posterity. 4:30am last Saturday morning, I awoke from my slumber to an obnoxious alarm and a cat sitting on my stomach waiting for food, it was at this moment I cursed not reading the event’s start times and booking us train tickets to get us into London for 9:00am. I crawled out of bed, checked my emails and then walked down the hill to find Kieran. Once we got to London we had about four hours to kill, so we went in search of food: it’s surprising to me that in the capital city of the UK it was actually quite hard to find somewhere to get something decent to eat that wasn’t a Nandos or some other fancier restaurant. We eventually gave up and went to a Starbucks, then decided to head to the Science Museum and Natural History Museum. We had a great time walking around looking at halls of dead animals and awesome artefacts from the history of computer science. One thing we got kinda irritated about was the lack of inspiration in some of the interactive exhibits at the museums were, it was kinda disappointing and we spent far too long critiquing them and suggesting improvements to an invisible museum owner in the sky. Eventually we got around to the ProcJam and it was AWESOME. So many inspiring people talking about making things that make other things. I got to meet Kate Compton in the flesh and have some really interesting chats with some of the developers behind No Mans Sky. I learnt more about Markov chains that I ever thought was possible, Kieran and I really want to make some Twitter bots using them in the near future. We did our talk on the pros and cons of using realtime data to produce games, we discussed the development of Hashtag Dungeon and how it went from early PCG to UGC over time. We told everyone about the downfalls of using data like Wikipedia that fluctuates on a daily basis and real time weather data that is as unpredictable as… y’know: the weather. We also had the pleasure of discussing our newest game Satan’s Hole and the plans we have in the future for using procedural generation for creating hellscapes. I think most people enjoyed it and had a good laugh, and that’s what counts really. I’ve seen some really cool stuff come out of this week. I’m super excited about the future of procedural generation in games and I’m looking forward to going back to the ProcJam opening ceremony next year to see what’s on offer! I’ve been getting periodic tweets and messages from people asking me what is going on with Hashtag Dungeon and when we’re going to be releasing on Steam. So I thought I’d give you some important information on it now to put your minds at ease. So as you might know I was studying a postgraduate certificate of education before the summer. It was a really heavy workload and I didn’t have much time for game development myself – turns out having to plan five lessons every day in depth leaves you with very little time for anything other than sleep. I was also going through a bunch of awful personal stuff which left me questioning if I even wanted to continue making games altogether; all of that is sorted now but it really put a halt on development for a good few months. I’m now teaching computer science at Lincoln UTC and it’s great – I feel a lot less stressed and have much more time at the weekend and nights to work on game-related stuff. Meanwhile Kieran was working on academic stuff over at The University of Lincoln as a research assistant so he’s been super busy too. But in about a week or so he’ll be finishing preparations for a big conference and can finally work full-time on the game for a while. This isn’t to say that the game is in the same state as it was when we released the magic update last year, because it’s definitely different now. We’ve overhauled all the UIs, added lighting into the game and implemented a bunch of new enemies, backgrounds and traps. Originally we planned to release all these different things as little updates a la Minecraft, but we thought why not pool them all together for a massive Steam-release update so that new players get an awesome experience and old players have a tonne of new things to mess around with. We didn’t want to release on Steam half-finished because that just seemed like a bad idea in general. Each of these classes brings a different strategy to the game, and some classes will be able to tackle different dungeons easier than others. It’s going to be interesting to see which classes people prefer to play as! We are looking to release the full 1.0 Hashtag Dungeon update onto itch.io on the 30 of September, roughly three weeks from now. We will be sending a message out to all current players to let them know it’s out so they can play it. We will then attempt to fix all the bugs the community finds and prepare the Steam version of the game once we are happy that the game is as stable as possible. We release on Steam as soon as that build is ready. and then give out Steam keys to everyone who needs one. I’m really happy with how things look and I’m really looking forward to getting player feedback. I’m sorry it’s taken so long to get the game onto Steam considering we got greenlit in December, but life is full of little distractions and road-bumps that make it hard to work on something like this full-time. I thought it might be a good idea to write a little blog post to talk about what is going on at Hitpoint Games; what our current plans are, what we are doing at the moment and what you have to look forward to this year. Let’s start with Hashtag Dungeon: myself and Kieran have been doing postgraduate degrees so unfortunately development has stalled since last December. We had plans to bring out a bunch of different updates but decided against it so that we have one massive update before we release on Steam that’s jam packed with new stuff for both old and new players to try out. We’re returning to full time development in August when I move up to Lincoln, we’re looking at a late September release on Steam. As part of the new update we have overhauled all of the user interfaces to make them easier to use. 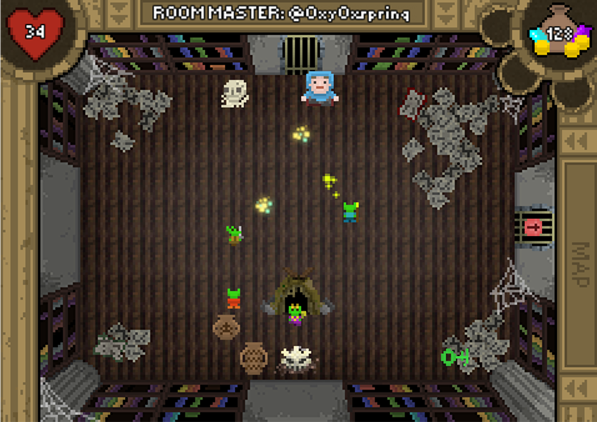 We’ve added a bunch of new traps and enemies and fixed a lot of renderings bugs. We’re also putting in different classes to play as: The Ninja, The Blood Mage, The Hunter, The Paladin and The Robot, to name a few – these will shake up the way you play the game and how you tackle certain enemies and situations. So yeah: Hashtag Dungeon, on Steam by hopefully the end of September. We are definitely going to need some beta testers so I suppose we’ll release the update early on itch.io and ask people to help test it for us. Secondly: Utopian – now called Utopia-N (based on the nth term of something…) has had a few changes. We’ve decided (for the moment) to remove the Wikipedia ties – the reason for this is that Wikipedia’s edits aren’t reliable enough to generate exciting and interesting gameplay: a lot of the time you’ll end up flying around a space without any enemies spawning because no one is vandalising Wikipedia at the time. We’ve also made the decision to try and make it into a mobile game. We think it would be really cool to get something out on mobile which is exciting to play and also graphically impressive. We spent this weekend getting the controls nailed down and now we’re getting in the core gameplay. It should prove to be a really fun mobile game without any of the general awfulness of traditional mobile games. Moving swiftly on, let’s discuss LUST: we’re currently working on the design document for this and I’ve drawn a lot of concept art for it. It’s not really safe for work though, so I’m not going to post it up on here until I finish teaching for the year. The game is going to be a procedurally generated FPS with a old-school aesthetic: nice low-poly enemies with pixelly textures. I’m really digging the way it’s looking and I’m excited to show you some screenshots of the level generation system when I get back from holiday! Finally we’re still working on Nectar Collector alongside Andrew Deathridge. He’s just taking a break after having finished his course and should be back on the development in the next few weeks. It’s a game about bees, so I am happy about it no matter what happens. The rest of this year will be a super exciting one for Hitpoint Games, we’re going to be releasing our first game on Steam and we’ve got a bunch of other projects simmering away. We are also accepting client work for the first time since opening our doors, which is a great way to keep us afloat whilst we continue doing this crazy little thing called game development. I’m really pleased to be spearheading things alongside Kieran and I’m sure you’ll all be pleased with what we’re working on. So it’s been a week since we launched Hashtag Dungeon so I thought i’d do a little post about how it’s gone so far and the problems we’ve encountered over the week. Launch day was incredibly hectic for me and Kieran. We were finding and fixing bugs till about 11:00 that night. Unfortunately it was also the day that Sky Broadband in Lincolnshire decided to stop working – completely. Kieran had to upload the final build of the game at about 2:30 in the morning via is phone. I was up till 3:30am getting the itch.io store front set up properly. This late launch would all have been fine if we didn’t have to be up at around 5-6am in order to get to London for the London Anime and Gaming Convention 2014… so there was absolutely no time for a lie in! Luckily we were in good spirits and managed to (with the aid of coffee) make it to London in time for set up. Many thanks to Tom, one of our most excellent musicians, for driving us down in the car. LAC was very exciting for all of us! It was our first experience of running a booth at an actual convention. I’d like to thank Pia for helping us arrange getting a table for the convention – we couldn’t have done it without you! Whilst I was at the convention the booth opposite us (manned by Ubisoft and GAME) decided they were going to do a free giveaway. I was manning the booth alone because it was too expensive for the other guys to come back for a second day, so I was naturally a little on edge about looking after all the equipment around me. Crowds gathered to get free swag and the guys on the other booth decided that they’d throw out PHYSICAL COPIES of random games into the crowd. One of them landed on the Hashtag Dungeon table… people turned and piled towards me in order to grab the game, knocking our banner and almost pushing my laptops off the table onto the floor. I wasn’t happy at all. Oh yeah and then I also got assaulted on the underground and had a bunch of other personal problems occurred over the week that left me feeling awful. I became pretty unproductive because I was really upset. I think karma was balancing itself out again because of the buzz I got from the launch! I’m okay now though – much more stable. Thanks to Louise, Alex, Richard, Byron and Christos for being there for me. I don’t often have particularly emotional weeks but occasionally everything becomes too much for my brain to compute. We decided we’d go for a soft launch and not actively contact sites like Polygon yet because we want to make sure the servers are able to handle the load over time. We were worried that if we got a massive surge of people playing in the first week we might end up having problems we wouldn’t be able to deal with quickly. We wanted to avoid a situation like other online-based games have on launch. Having a soft launch has been excellent because we’ve been able to deal with bug reports on a one-on-one basis. If we’d had loads more people playing we’d probably get spammed with the same bug report over and over again. It’s nice to have a small community at this point as we can talk to them all directly. Kieran has been amazing at responding to and fixing bugs. He’s worked tirelessly every day fixing things and communicating with players who are having issues. He’s even finished the first version of the Hashtag Dungeon launcher that allows us to push updates out to our players quickly and easily. I want to thank him for being the best co-developer ever, he’s been amazing. He’s been really on the ball whilst I’ve been feeling pretty down. I’m going to be at the Loading Bar on Monday showing the game off at a big event! Thanks to Failnaut for inviting me along to show the game off! I’m really excited for it – hopefully we’ll get some interest in the game and maybe sell a few more copies! We also have a tutorial video coming soon with wonderful voice over work by my good friend Greg. I’m looking forward to hearing it! It should give non-players a better idea of how people make dungeons. If you’ve not played the game and are interested then you can buy it from our website! The current build is Alpha 1.3.2 and once you’ve purchased the game you’ll get access to all updates afterwards for free! Supporting us now means that we’ll be able to continue to make the game bigger and better. Last Thursday was the launch event for this years GameCity festival where the nominees and judges for this years prizes were announced. 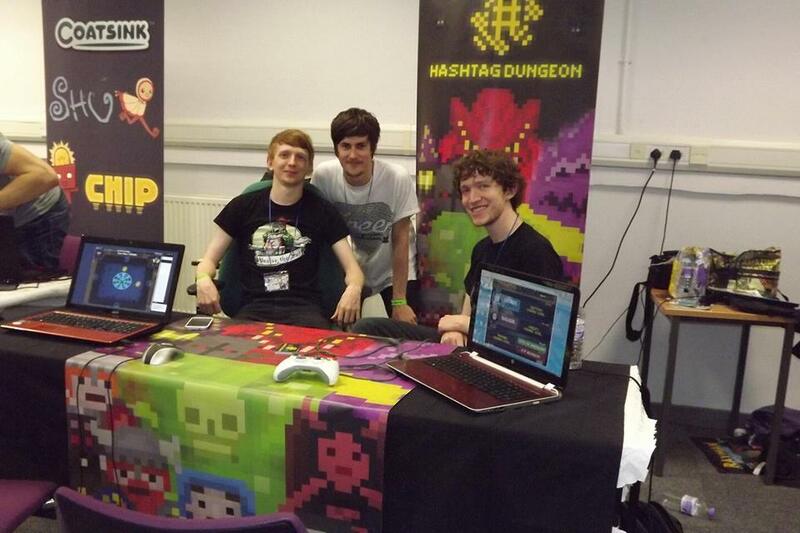 Myself and Kieran had the opportunity to show off the current build of Hashtag Dungeon at the event! It was really cool to see people playing and talking about the game. It’s definitely shown us what things we need to improve upon over the next few weeks and what is good about it right now. We also had chance to take part in the Spaceteam Admirals Challenge which was really fun but we didn’t do particularly well at it (3rd from last… could have been worse I suppose…) Congratulations to the winners of that by the way – those medallions you got looked really sweet. 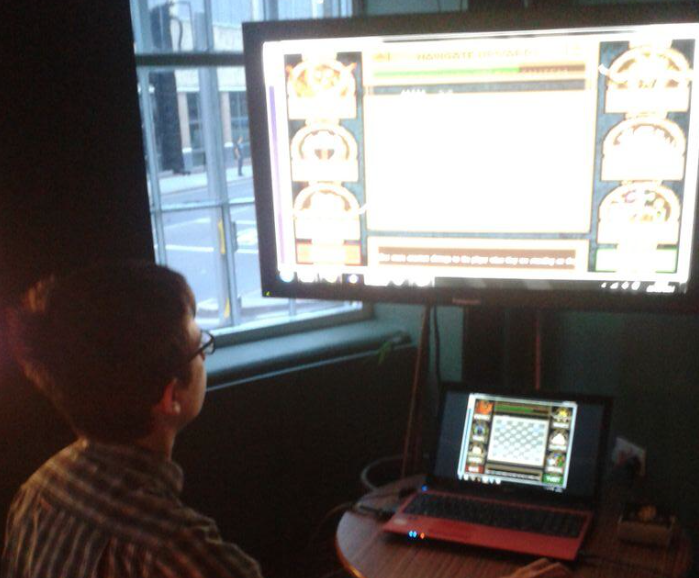 I very much enjoyed myself and I’m really looking forward to my first trip to the GameCity festival this year. I’m also excited to show our game off again – hopefully we’ll have worked out the bugs by that point! I’d like to thank Dr. Patrick Dickinson for coming along to the event to support us, Alex for helping get me in contact with the people running GameCity and Iain and Chloe for making me feel super welcome! It was also really cool to see Sam from Boxface Games again – he’s seriously the coolest kid I’ve ever met – ever. This is just a quick little blog post to thank everyone who has tweeted, retweeted or blogged about Hashtag Dungeon so far. Myself and Kieran have been flipping out at every positive comment, response or article we’ve found. We’d like to thank everyone for the great interest in our game. We’re working super hard to get the game out as early as we can in order for you guys to get your hands on it. 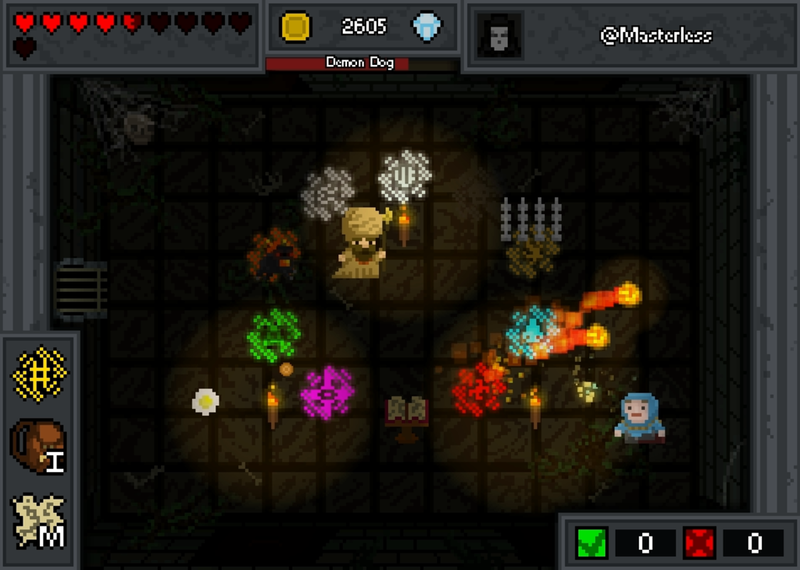 I cannot even begin to explain how excited I am to see what everyone does with the dungeon editor – if it’s anything like the fancy stuff I’ve seen done by our alpha testers then I’m going to be so happy. I’m really looking forward to playing through your dungeons… hopefully you won’t make them too hard (I’m kinda sucky at not getting hit by stuff – especially goblins). 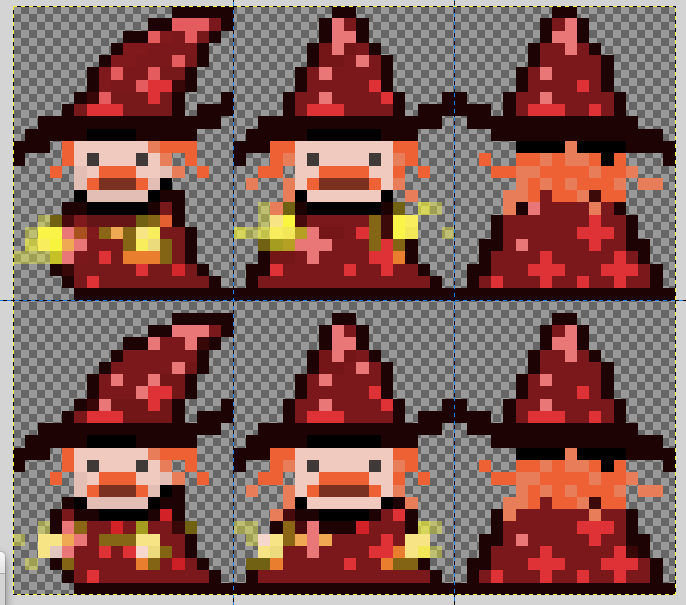 I’m going to get back to working on sprites now. The more enemies, items and traps I can cram into the game before we release the better. We’d really appreciate it if you guys continue to give us feedback and share around the game with anyone you think might be interested – that’d be super special awesome of you.